Hi, dstm! Big thanks for your miner. I gets a lot of RECV, farm reconnects and keep working, but I think, that shares a lost. I changes overclocking for minimum (tdp 50%), but RECV still my guest. This is not due to overclocking, it's a network issue, are you on wifi? "Thank you for your question, generally we see this error from clients with low internet connections or now wired connected rigs." But WiFi farm has much low recv. To exclude all factors, I reistall MSDN Win7_64 Pro Licensed with integrated updates, install 388.73 driver, vc++2015 and now has a very smooth flight for the 2 days with the only one recv (but in the same time with my friend, so that is because of flypool). 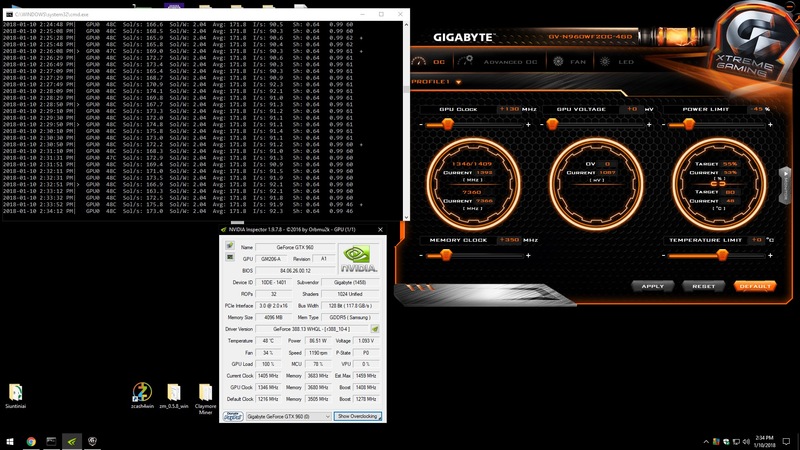 Big thanks to rotating me from overclocking, to the internet, its much easier to fix. That is much more than 2%. Hopefully there is a genuine explanation in there. I'm about the last person to defend the devfees charged by some of these miners, because many of them are still beta or even alpha-level in functionality/reliability, but I suspect the explanation here is that the devfee shares are mined at a much lower difficulty to better ensure a share is earned during the short mining period allotted. But this is just a theory on my part. I think your theory is right. so counting * an + is a waste of time. I've checked the devfee, it is exactly 2%. Ok, thanks guys, good to hear. Sorry for the newbie question, which might be already answered - dstm is for zcash, or all mineable coins with equihash algo, i mean can dstm be used for zclassic, or zencash for example? Thanks in advance. I am curious as to how you determined which pool/wallet zm was using? Yes, just use an appropiate wallet address and mining pool. is this a bad thing? never got share zero-drop with ewbf. Will DSTM be adding additional algos? when I run a fews hours，always auto quit cmd，and then do nothing，It waste a lot of time until I know it. I have a strange issue with Linux version. I`m new with Linux so the issue could be simple. I started mining with ZM 0.5.2 - It`s working like a charm!!! I set up a telemetry to 0.0.0.0:42002. In windows I make the same and it uses the address of computer. And I could enter it via, for example - 192.168.0.1:42002. With windows version it works, but with Linux version telemetry does not open via browser. Could you please say me were I`m wrong. Did you got your IPs right? Does 'http://127.0.0.1:42002' work if try it in a browser on the same system zm is running on? How can you make it run on specific graphics cards only. Pool failover still on the books for the next release? What do you think, can i get better? how to mine with ZM using only xyz GPU card? what is the syntax / command for this , please? "con: add support for protocol v.01000020"
What does the "con" mean ? Do you use any other mysterious abbreviations ? Also what protocol v01000020 are you referring to? Howsit, thanks for your reply it was meaninful and helpful. any monitoring http protocol or soft for this?